Origin and Habitat: Ariocarpus fissuratus grows naturally in Southern USA northern Mexico on dry limestone ridges and rocky hills of limestone chip, but the form "pectinatus" has been only described from cultivated specimen. Description: Ariocarpus fissuratus f. pectinatus is an odd very rare plant distinguished by long adiaxal areoles that stretch out to the full length of the tubercle and uncommon short pectinated spines. This plant differs from the standard Ariocarpus fissuratus, for its short pectinated spines already present in young specimens. The spines persist with the age, but in adult plant they are partially covered by fur. Similar species: Ariocarpus retusus subs. pectinatus Weisbarth shows similar pectinated spines, and is much more common in cultivation. Habit: It is a geophyte plant that produces a star-shaped rosette of fleshy, deltoid to hemispheric tubercles, which have no spines and lie almost flat on the soil surface. They are usually solitary, rarely giving rise to side shoots from old areoles, they grow extremely slowly, to 20 cm in diameter. Areoles: The areoles are up to 3 mm wide, linear, stretching out to the full length of the tubercle. Spines: Short, arranged like the teeth of a comb on the full length of the linear areola, about 2-5 (or more) mm long. 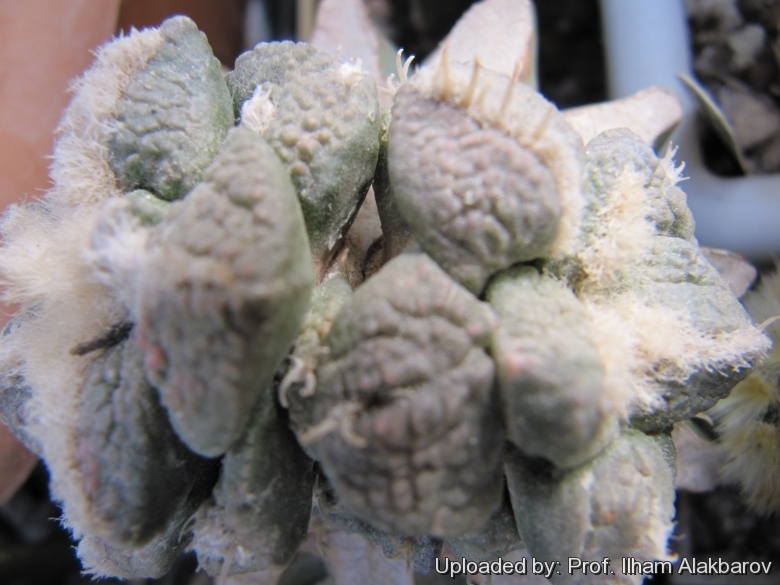 Cultivation and Propagation: Ariocarpus fissuratus is not too difficult in a greenhouse, although it grows extremely slowly (it starts blooming at the age of 8-12 years). Repotting: The plants need deep pots to accommodate the napiform unit formed by the stem base and the rootstock (or they will often simply crack your pots). Generally, they should be repotted frequently at least every other year in order to provide fresh soil. However, old plants become senile and have a tendency to succumb to disease and a weak root system. At this stage, as is well known, they die suddenly. So, after they reach 20 cm in diameter grow them slowly, and adopt a new repotting period, using intervals of every 3 years. Additionally grow them under drier conditions or with stronger sunlight. However, repotting doesn't necessarily mean they'll need larger containers.